Hill-Bert’s Burgers began in 1973 when a University of Texas student decided to make the best burger in Austin. That was our dad. And today our burgers are still like those that friend of your’s dad made back when you were in middle school — the kind of burger that made you pray the kid’s old man was working the grill every time you headed to their place. Well, we were that kid, and the guy at that grill was our dad. 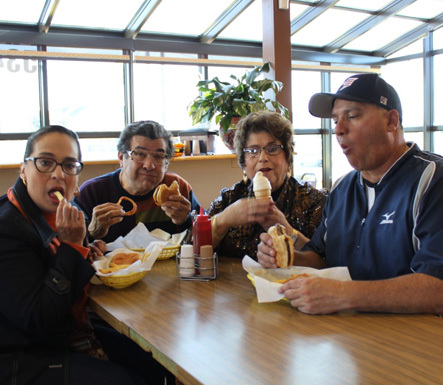 Dad and Mom (her name’s Lucille) began Hill-Bert’s Burgers with their own burger and milkshake recipes, and they’re still the real deal, old school, the best in Austin. And then there are Hill-Bert’s onion rings – hand breaded in our kitchen. And our webmaster demands that we mention our hand-breaded chicken fried steak sandwiches. (He’s kind of a fan.) Mom and Dad created a local legend, and we’re proud of them. So feel free to introduce yourselves when you come in. One of us is almost always around – making sure things are done the way Hilbert and Lucille want it done. See ya soon!